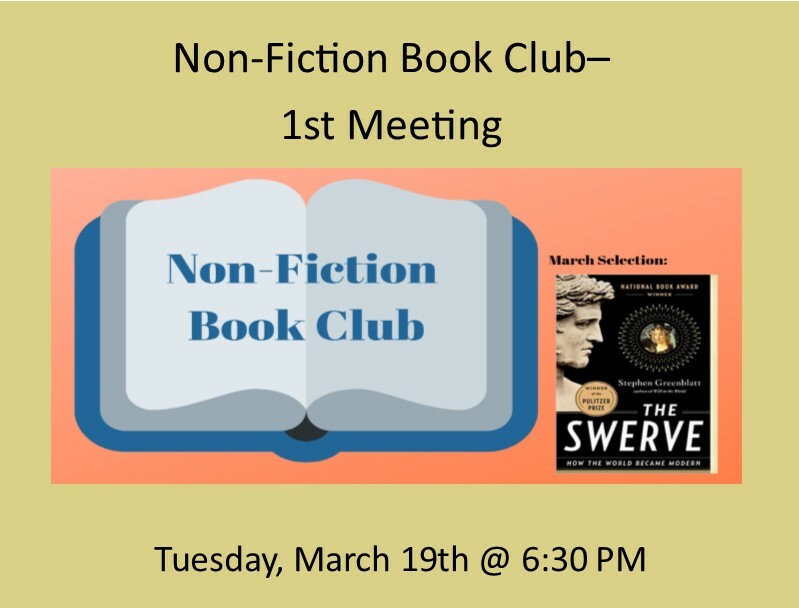 Join us for the first meeting of the new Non-Fiction Book Club. The first selection is Stephen Greenblatt’s “The Swerve: How the World Became Modern”. Future selections will be chosen as a group. The Swerve was winner of the 2012 Pulitzer Prize for Non-Fiction and 2011 National Book Award for Non-Fiction. From Amazon: “Stephen Greenblatt has crafted both an innovative work of history and a thrilling story of discovery, in which one manuscript, plucked from a thousand years of neglect, changed the course of human thought and made possible the world as we know it. Copies of this book will be available at the library Circulation Desk.